2015 Nissan Leaf 30kWh review | What Car? In case you’ve missed it, the electric revolution is underway. We’ve already got electric super saloons such as the Tesla Model S, and even a hybrid-electric supercar in the form of the BMW i8. 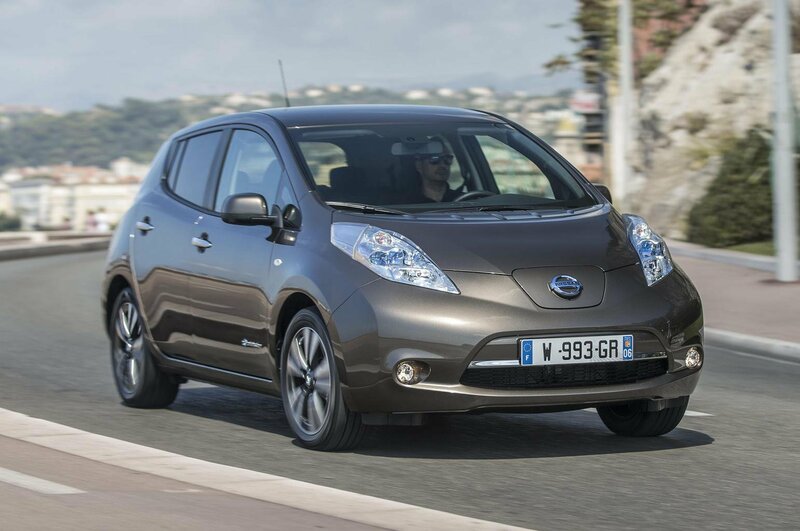 If you want to sign up to this revolution but can’t afford those cars' hefty price tags, the Nissan Leaf 24kWh has offered you membership to the electric vehicle (EV) club since 2010 - and still does, from just £20,790. However, if the 24kWh version’s claimed range of 124 miles (which in the real world is nearer 70 to 80 miles) isn't enough for you, then you'll be interested to hear that the world’s most popular EV can now go 25% farther. It's thanks to the bigger battery in this new 30kWh model, which sits alongside the existing line-up. Nissan reckons it’ll manage a maximum of 155 miles on a single charge, which in general driving will be more like 100 to 120 miles. The bigger battery is only available from the mid-level Acenta trim upwards, so prices start from £24,490 if you include the £5000 government subsidy. For that price, you also get a warranty that covers the battery for up to eight years or 100,000 miles. Curiously, the warranty for the 24kWh version remains at five years or 60,000 miles. The new car is 21kg heavier than the 24kWh version, but that shouldn’t make too much difference to how it feels on the road. Indeed, the performance is identical, taking 11.5sec to reach 62mph, before heading to a top speed of just less than 90mph. Whether you chose the existing 24kWh or the 30kWH version, all Leafs from Acenta trim up benefit from an improved infotainment system called Nissanconnect EV. This includes a DAB radio, 7.0in touchscreen and sat-nav, plus a host of new features. For instance, the system can tell you how far you are from the nearest charging point – of which there are currently an estimated 9384 spread across the UK, including 500 30-minute rapid chargers - and whether or not it’s occupied. Using an app on your smartphone you can also check remotely on the Leaf’s charge status, or, if you’ve forgotten where you left it, locate it on a map. On frosty mornings, you can even use your phone to switch on the car’s heater, making it nice and toasty before the morning commute. There are alternatives to the Leaf, which includes the Kia Soul EV and the Volkswagen e-Golf. However, with its new battery pack, neither can boast the new range potential of the Nissan. What’s the 2015 Nissan Leaf 30kWh like inside? Apart from the infotainment it’s exactly the same as before. Up front, the seats provide the cushioning of a softly sprung armchair, but with plenty of support for longer trips. You don’t get a reach adjustable steering wheel and the driving seat is missing that last inch of travel to satisfy really tall drivers, but nevertheless the Leaf still offers a decent driving position. Forward visibility is slightly restricted by the thick, angled windscreen pillars. The wide rear pillars also limit your over-the-shoulder vision, but the standard rear-parking camera means it’s not too much of an issue. While the Leaf’s cabin is perfectly functional and well laid out, anyone used to the plusher-feeling materials in an e-Golf or Soul EV will find the Nissan a bit sparse; there’s hardly any soft-touch surfaces and a proliferation of scratchy plastics. That said, Nissan’s excellent showing in our latest reliability survey suggests it should be durable and withstand the rigors of family use. The new infotainment system is loaded with features and simple to use. It’s got clear graphics and intuitive menus, and the only complaint is a slight lag after pressing some of the onscreen icons. In the rear, the leg room is excellent bearing in mind the Leaf’s size, but tall folks may find the headroom a bit tight. It’ll still fit two adults or three children, but they would have more room to relax in the back of the EV Soul. The Leaf does regain points for the biggest boot, though. There’s some intrusion from the rear suspension mountings, but it’s still deep and easily big enough to swallow a couple of pushchairs. What’s the 2015 Nissan Leaf 30kWh like to drive? If you think 0-62mph in 11.5sec sounds slow, you need to drive a Leaf before passing judgment. EVs have an instantaneous surge off the line, which means the Nissan feels sprightlier away from the lights than many regularly powered hatchbacks. This makes zipping around town easy and fun, and only when you get past 50mph does this sense of urgency begin to wane. The other magical aspect of e-power is the serenity that ditching an old-school combustion engine brings. Around town, the Leaf’s as quiet as the proverbial church mouse, while at higher speeds all you hear is mostly wind and road noise. There is a fair bit of suspension noise as well, and it struggles to keep the ride controlled at times. Big speed bumps aren’t a problem, but deep potholes cause a shudder and it struggles to settle on patchy, broken surfaces. Carrying all those batteries can make EVs handle a little ponderously, but driving the Leaf around the twisting hill roads of southern France was a relative blast. It feels light-footed and surprisingly grippy, and although the steering weight is rather unnatural, it’s accuracy is impressive. Try to have too much fun and the front will wash wide, at which point the stability control kicks in to safely pull them back in line. Five years ago the Leaf stole a march on the mass electric car market. As a result, it became a huge hit with buyers looking to take advantage of an EV’s low running costs – Nissan estimates this can be as little as 2 pence per mile. Even today, a 24kWh Leaf starting from around £20k remains one of the cheapest roots to EV ownership. The extra range of this 30kWh version will be invaluable to some, in which case it’s a recommended buy. However, if you don’t need the extra range, we’d stick to the cheaper versions and save some cash. If you are still thinking about spending around £25k on an EV and can stomach a real-world range of around 80 miles, more conventionally packaged cars like the e-Golf and Soul EV are worthy alternatives to consider.